There is actually a reason why I decided to have my comeback post be Miyafuji Yoshika (宮藤芳佳,) and I’ll get to that in a moment. First off, let’s get to the meat and potatoes of this review. First off, accessories. Miyafuji comes with a a fairly significant amount of bonus accessories, the most prominent being the A6M3a “Zero” Striker Unit. I’ll go into greater detail about the Striker Unit shortly. Accessories for the Striker Unit include propellers and what I call “motion discs” that simulate the propellers in motion. Also included is her Modified 13mm Type99-2-2 Machine Gun with shoulder strap. 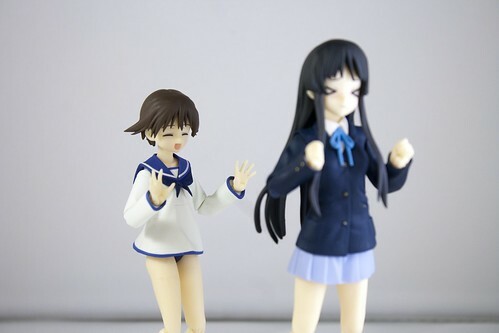 Miyafuji also comes with 2 bonus faces: one intense and serious and one happy with eyes closed. An extra set of bangs is included with fox ears attached for when she is using her magic, and a fox tail that attaches to a hole in her backside. 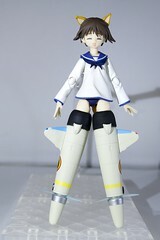 An extra set of hips is also included in order to acheive a fixed position pose with her legs in front of her for the Striker Unit. 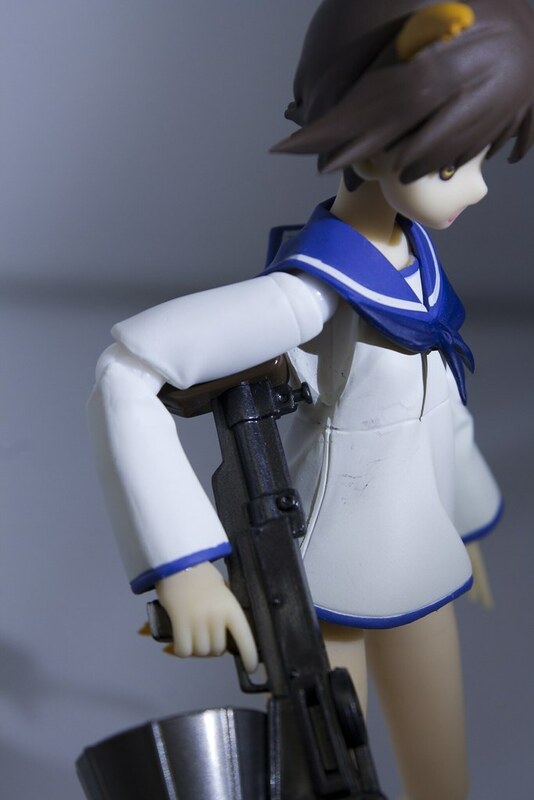 Miyafuji’s hand set comes with 2 hands specifically to hold her rifle (with the index finger out for the trigger) 2 standard accessory hands, 2 closed fists and a pair of “groping” hands. 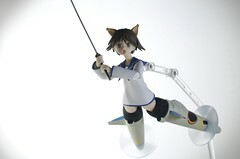 She also comes with an extra left hand to support the rifle when she is using it. Miyafuji's "Groping" hands "in action"
Now, I mentioned that there was a reason why I chose Miyafuji as my “return to blogging” review. That reason is this: paint transfer. 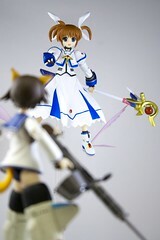 Lots of figmas have had issues with paint transfer, some more than others. 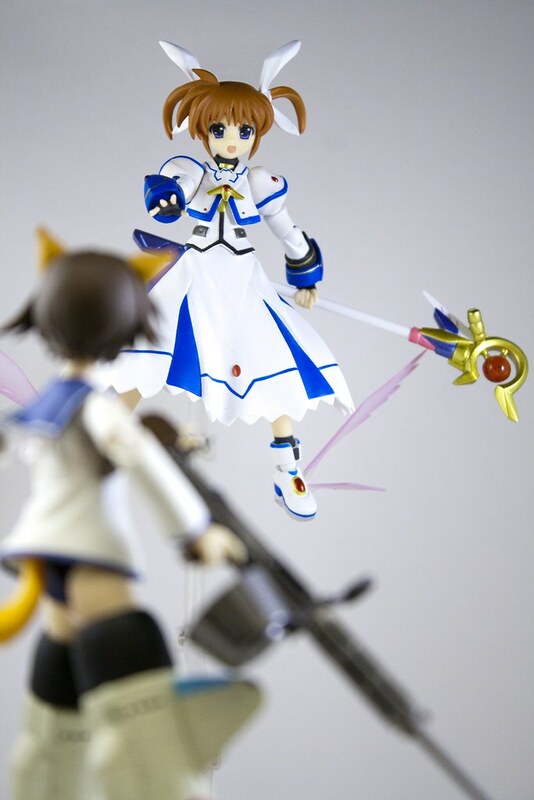 One in particular that sticks in my head is the skirt from the first Takamachi Nanoha figma that would leave black marks on the figure at times. 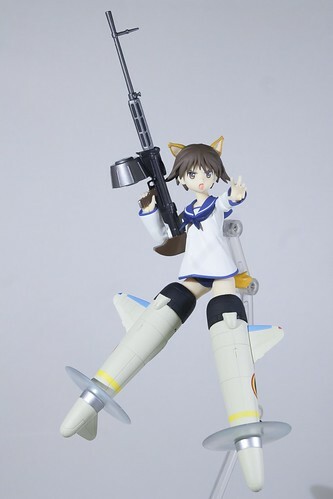 For some unknown reason, Miyafuji’s clothes and the Striker Unit itself (primarily the part where the legs go into the unit) were painted with a matte paint, which transfers easily to other surfaces. 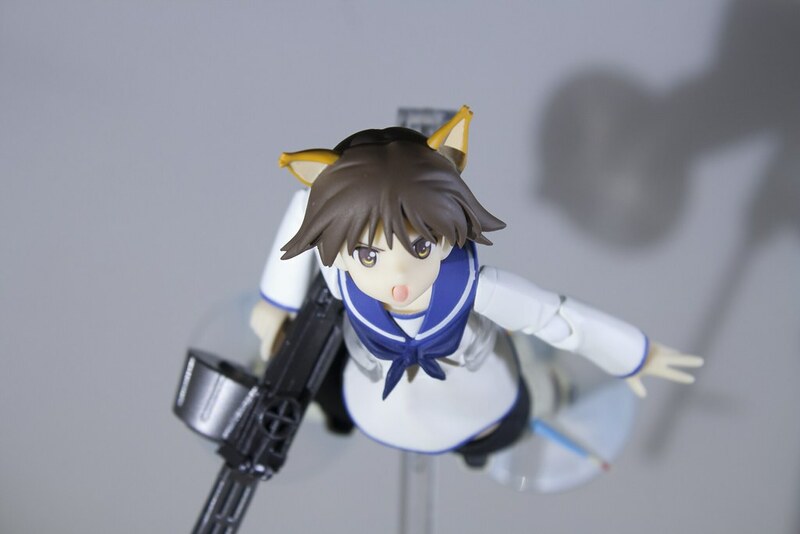 Because of this, black marks can easily transfer to Miyafuji’s thighs, and transfer from her rifle will create brown scratches on the right side of her torso if you pose with it close to her body. Now this isn’t anything too troublesome, as a good buffing with get rid of most of the damage, but it gets annoying when you have to do it time and time again. 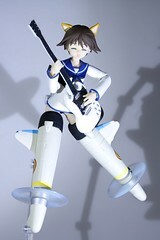 As you can see, the damage is quite visible on a pure white matte painted body and light colored PVC. 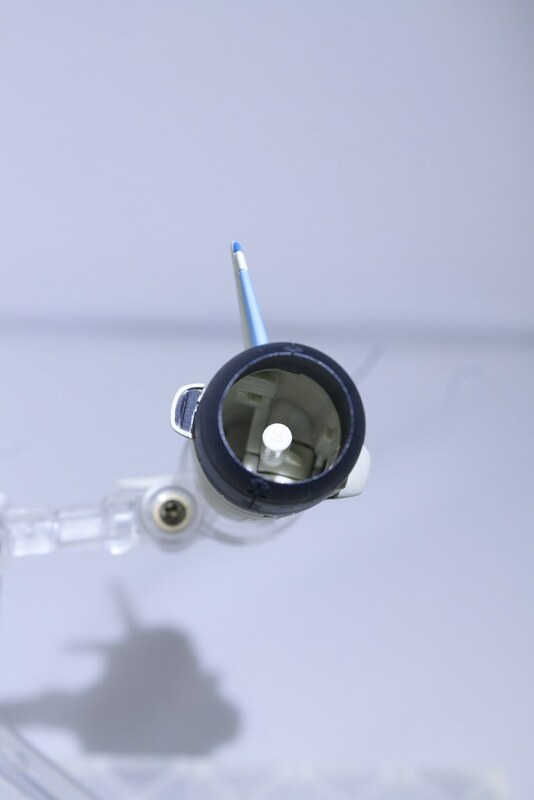 A simple solution for the Striker Unit damage is to apply a few small strips of electrical tape to the inside of the Striker Unit so paint does not transfer to Miyafuji’s (or any other figma you decide to use the Striker Unit with) legs. I am still working on a solution for the body damage, but don’t think I’ll find one as easy as the elec-tape remedy for the Striker Unit. 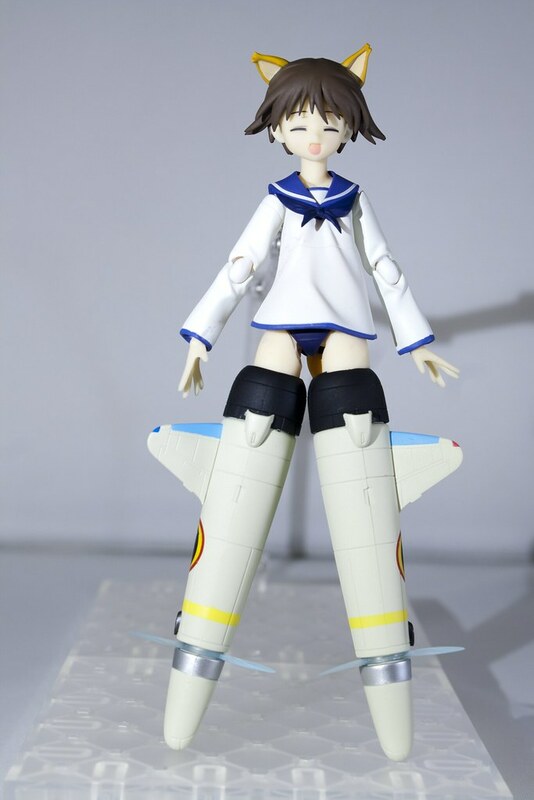 In order to attach the Striker Unit to a figma’s legs, you first need to remove the lower legs and the figma joint in between. The peg you see in the picture above slides into the joint hole in the thigh, which keeps is somewhat secure. Once you get some electric tape in the inside of the opening, you should’ve have to worry about paint transfer anymore. 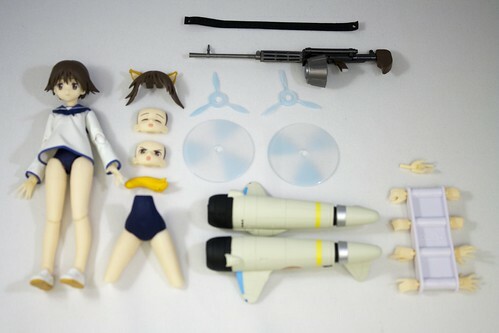 The “feet” of the Striker Unit can be removed and the black “collar” can be replaced by either the propellers or the motion discs. When being displayed with the Striker Unit, the “wings” point away from the body with the small exhaust ports facing forward as in the picure above. 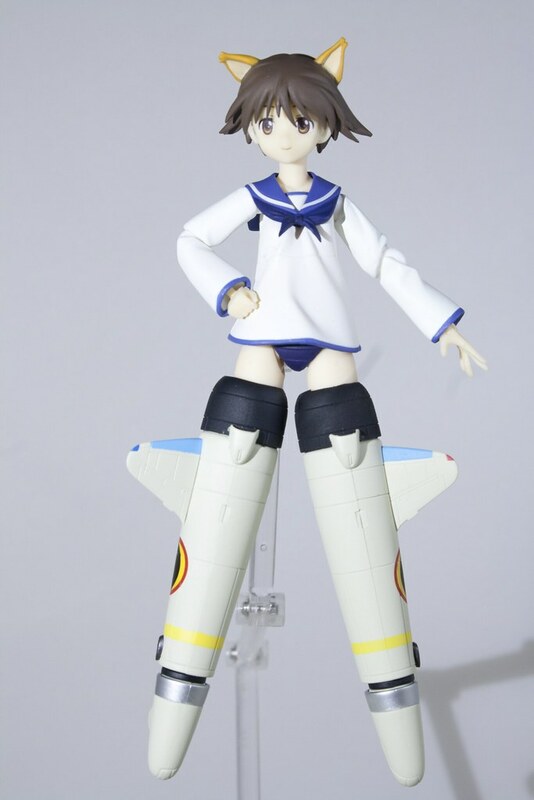 The fins on the “feet” either face directly back or at a slight angle outward, just like the real plane that it is based on. 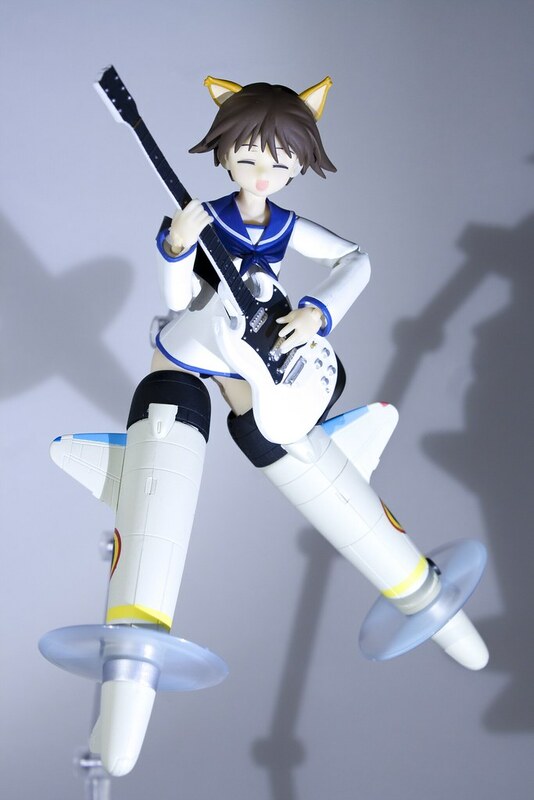 Pros: Miyafuji is very versatile and comes with unique accessories that haven’t been brought to the table yet, namely the Striker Unit. 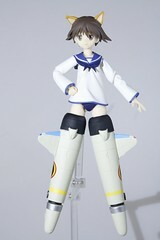 Because it was built as a seperate unit and not something unique to Miyafuji, it can be swapped to other bare legged figmas easily so that many figmas can experience the joy of flight. simply now running on, and I’ve been on the glance out for such info.